Jalal-Abad provincial prosecutor’s office has concluded its criminal investigation against Uzbek community leaders in southern Kyrgyzstan; namely Kadyrzhan Batyrov, Inom Abdurasulov, Abdrakhman Abdullayev, Makhamatrasul Abakzhanov, Khalilzhan Khudayberdiyev and Khavlon Mirzakhodzhaev. The file has now been handed to the courts and the trial will be chaired by Sulaiman Attakulov starting from April 29 in Jalal-Abad city court, prosecutors told Ferghana News Agency. All the above are being charged on the following articles from Kyrgyzstan criminal code: Article 233, section 1, 2, 3 – “Organization and participation in mass unrest”; Article 295, clause 1 – “Separatist activities, that is activities aimed at violating the territorial unity of the country, including attempting to break away a section of territory or foment disintegration of the state by violent means”; Article 299, section 2, clauses 1,3 – “Inciting ethnic, racial, religious or interregional hatred”; Article 30-97, section 2, clause 1, 5, 9 – complicity to murder. 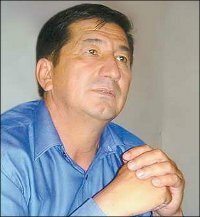 The most dramatic accusations made against Uzbek community leaders have been made by former Ombudsman Tursunbek Akun. The government commission into the events in Osh, which operated under Akun’s leadership, determined that "the local conflict [in southern Kyrgyzstan], was started by ethnic Uzbeks, such as Batyrov, I. Rasulov, J. Salakhutdinov, and Abdullayev." “They started this conflict, they financed it, they incited simple Uzbek farmers against Kyrgyz, but Kyrgyz people are very tough and finished it off sharply. The aim of the provocateurs was to seek autonomy and to raise the Uzbek language to official status. They wanted to transform Osh and Jalal-Abad regions into autonomous regions of Uzbekistan. They had a links with Uzbek citizens, rich Uzbek people opposed to Karimov. They wanted to overthrow Karimov and instead elect a person and manage all of Uzbekistan, including the Jalal-Abad and Osh regions," the report said. Batyrov was earlier prosecuted on different criminal charges. As the Prosecutor General’s office told Ferghana on March 31, Batyrov was charged under Article 168, section 2, clauses 1,2, section 3, clause 2, section 4, clauses 2, 3 (Robbery); Article 174, section 2, clauses 1, 2, 3 (Deliberate destruction or damage to property); Article 141, section 2, clause 3 (Illegal purchase, transfer, sale, storage, storage of firearms, ammunition, explosives and explosive devices). Criminal cases against Batyrov have been opened repeatedly. On the first occasion it was pursued by Jalal-Abad regional prosecutors on May 19, 2010. During investigations on August 13, 2010, an order was issued to preventively detain Batyrov. That was dropped on October 9 due to "failure to locate Batyrov.” On January 29, 2011, the prosecutor's office overturned that decision and the case was resumed. A criminal case was transferred to the Jalal-Abad region prosecutor’s investigative team, which brought the investigation to trial. Batyrov is currently located overseas, it is believed in Ukraine. The remaining Uzbek leaders and “separatists” are also outside Kyrgyzstan. So it is that the trials will take place without the defendants present and the sentences will also be handed down in absentia. Ferghana News Agency will be following the progress of the trial. Uzbek separatism – fiction of politicians or threatening reality in Kyrgyzstan? Kyrghyz and Uzbeks in Osh: Just another local interethnic conflict?